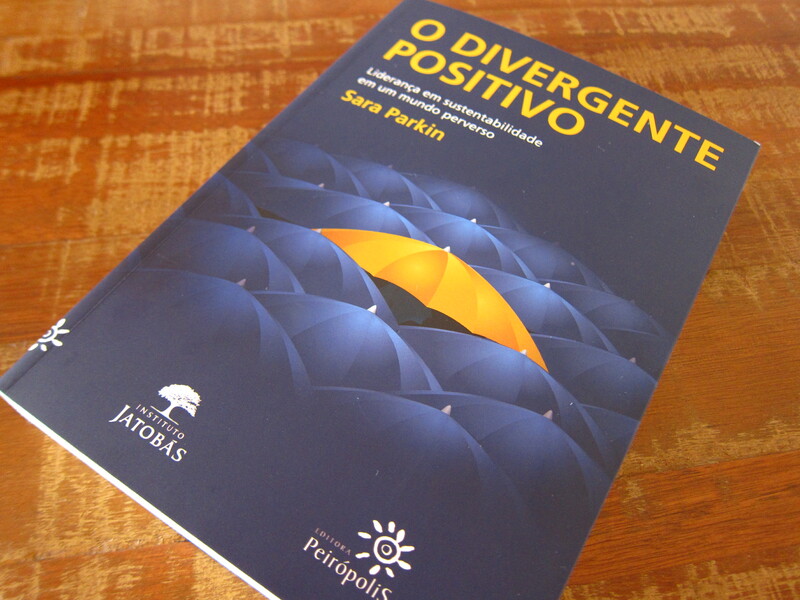 I was delighted yesterday to receive a copy of Sara Parkin’s The Positive Deviant from my friends at Instituto Jatobás. Instituto Jatobás is a non-governmental, non-profit organization whose mission is to influence the expansion of awareness of sustainable thinking and provide knowledge to build a supportive and sustainable collective way. In 2012, Jatobás Institute launched the Brazilian edition of The Top 50 Sustainability Books (see Maria’s article in Portuguese: O Lançamento do Livro Os 50+ Importantes Livros em Sustentabilidade for photos of the book launch), and this year, in partnership with Peirópolis, they are now lauching O Divergente Positivo (the Portuguese title). Sara Parkin is Founder Director of Forum for the Future, the UK’s foremost sustainable development charity and a life-long campaigner for a socially and environmentally just way of life. She established the well regarded Leadership for Sustainable Development Masters at Forum and received an OBE in 2001 for services to education and sustainability. The Positive Deviant was originally launched in 2010, and in case you have not had a chance to read it, I thought I would offer a short summary here. Next week she will be coming to Brazil where she will be speaking at a number of events, many of which are open to members of the public, giving those of you in Brazil a chance to meet Sara in person. The central theme of the book is sustainable leadership, and as Parkin notes, there is no single model of leadership that will suit every person. For Parkin, sustainable leadership is about confidence and authenticity, and much of the book has been written to enable those who are looking to move into leadership roles insights into their own current styles of leadership. To be a positive deviant involves much more than a quest for examples of good practice. It is a strategic commitment – by you and (ideally) your organisation – to rebellion against the perversity of living with so many anti-sustainability policies and practices. It is not a strike or campaign against what is wrong that I am recruiting for, but a manifestation for what is right. Of, it is my fervent hope, such a scale and speed, that sustainability-literature behaviour quickly becomes the norm. This is a book which rewards deep engagement with the issues it explores, which it does so comprehensively, with chapter eight providing many practical tools and techniques designed to help readers “get going without delay”. Resilience: The capacity of a person, material or system to experience shocks while retaining essentially the same function. Relationships: The strength, happiness and resilience gained from many interdependencies. Reflection: The time required to think about things so as to learn from experience. Reverence: The demonstration of a ‘respectful awe’ for the power of the natural world and the intimacy of our biological relationship with it. Parkin writes that “to be authentic, and therefore trusted, and worthy of being followed, you have to be true to yourself.” Quite rightly, Parkin spends time examining morality, ethics and values. This for me is the most important section, for without values, the tools and frameworks become meaningless. Littered throughout the book, asterisked for easy reference, are many many examples of positive deviants, one of whom is Fiona Reynolds, Director General of the National Trust UK. Reynolds, Parkin tells us, is “one of the most sustainability-literate leaders I know” and who says that if we cut her in half we would “find her values written through her like a stick of Blackpool rock”. We have seen a couple of recent posts, one regarding FriBoi meat and Roberto Carlos, and the other regarding Guarana and Neymar, that brands can sometimes get it wrong, and accidentally communicate implicitly values which run counter to the explicit values of the brand. Just because someone is discussing sustainability, and even ethics and values, it does not necessarily mean that their actions match their words, and so Parkin offers some very wise and profound advice to those seeking to be truly authentic leaders in sustainability. On 24th March in São Paulo, Sara will be speaking about sustainability with Fábio Barbosa, the president of Abril S.A. – further information. Sara will be speaking at Sustentare Business School in Joinville on 27th March – further information.